This article is about mass density. For other uses, see Density (disambiguation). For a pure substance the density has the same numerical value as its mass concentration. Different materials usually have different densities, and density may be relevant to buoyancy, purity and packaging. Osmium and iridium are the densest known elements at standard conditions for temperature and pressure but certain chemical compounds may be denser. To simplify comparisons of density across different systems of units, it is sometimes replaced by the dimensionless quantity “relative density” or “specific gravity“, i.e. the ratio of the density of the material to that of a standard material, usually water. Thus a relative density less than one means that the substance floats in water. In a well-known but probably apocryphal tale, Archimedes was given the task of determining whether King Hiero‘s goldsmith was embezzling gold during the manufacture of a golden wreath dedicated to the gods and replacing it with another, cheaper alloy. Archimedes knew that the irregularly shaped wreath could be crushed into a cube whose volume could be calculated easily and compared with the mass; but the king did not approve of this. Baffled, Archimedes is said to have taken an immersion bath and observed from the rise of the water upon entering that he could calculate the volume of the gold wreath through the displacement of the water. Upon this discovery, he leapt from his bath and ran naked through the streets shouting, “Eureka! Eureka!” (Εύρηκα! Greek “I have found it”). As a result, the term “eureka” entered common parlance and is used today to indicate a moment of enlightenment. The story first appeared in written form in Vitruvius‘ books of architecture, two centuries after it supposedly took place. Some scholars have doubted the accuracy of this tale, saying among other things that the method would have required precise measurements that would have been difficult to make at the time. From the equation for density (ρ = m/V), mass density has units of mass divided by volume. As there are many units of mass and volume covering many different magnitudes there are a large number of units for mass density in use. The SI unit of kilogram per cubic metre (kg/m3) and the cgs unit of gram per cubic centimetre (g/cm3) are probably the most commonly used units for density. One g/cm3 is equal to one thousand kg/m3. One cubic centimetre (abbreviation cc) is equal to one millilitre. In industry, other larger or smaller units of mass and or volume are often more practical and US customary units may be used. See below for a list of some of the most common units of density. A number of techniques as well as standards exist for the measurement of density of materials. Such techniques include the use of a hydrometer (a buoyancy method for liquids), Hydrostatic balance (a buoyancy method for liquids and solids), immersed body method (a buoyancy method for liquids), pycnometer (liquids and solids), air comparison pycnometer (solids), oscillating densitometer (liquids), as well as pour and tap (solids). However, each individual method or technique measures different types of density (e.g. bulk density, skeletal density, etc. ), and therefore it is necessary to have an understanding of the type of density being measured as well as the type of material in question. The density at all points of a homogeneous object equals its total mass divided by its total volume. The mass is normally measured with a scale or balance; the volume may be measured directly (from the geometry of the object) or by the displacement of a fluid. To determine the density of a liquid or a gas, a hydrometer, a dasymeter or a Coriolis flow meter may be used, respectively. Similarly, hydrostatic weighing uses the displacement of water due to a submerged object to determine the density of the object. In practice, bulk materials such as sugar, sand, or snow contain voids. Many materials exist in nature as flakes, pellets, or granules. Voids are regions which contain something other than the considered material. Commonly the void is air, but it could also be vacuum, liquid, solid, or a different gas or gaseous mixture. The bulk volume of a material—inclusive of the void fraction—is often obtained by a simple measurement (e.g. with a calibrated measuring cup) or geometrically from known dimensions. Mass divided by bulk volume determines bulk density. This is not the same thing as volumetric mass density. To determine volumetric mass density, one must first discount the volume of the void fraction. Sometimes this can be determined by geometrical reasoning. For the close-packing of equal spheres the non-void fraction can be at most about 74%. It can also be determined empirically. Some bulk materials, however, such as sand, have a variable void fraction which depends on how the material is agitated or poured. It might be loose or compact, with more or less air space depending on handling. In practice, the void fraction is not necessarily air, or even gaseous. In the case of sand, it could be water, which can be advantageous for measurement as the void fraction for sand saturated in water—once any air bubbles are thoroughly driven out—is potentially more consistent than dry sand measured with an air void. In the case of non-compact materials, one must also take care in determining the mass of the material sample. If the material is under pressure (commonly ambient air pressure at the earth’s surface) the determination of mass from a measured sample weight might need to account for buoyancy effects due to the density of the void constituent, depending on how the measurement was conducted. In the case of dry sand, sand is so much denser than air that the buoyancy effect is commonly neglected (less than one part in one thousand). Mass change upon displacing one void material with another while maintaining constant volume can be used to estimate the void fraction, if the difference in density of the two voids materials is reliably known. In general, density can be changed by changing either the pressure or the temperature. Increasing the pressure always increases the density of a material. Increasing the temperature generally decreases the density, but there are notable exceptions to this generalization. For example, the density of water increases between its melting point at 0 °C and 4 °C; similar behavior is observed in silicon at low temperatures. The effect of pressure and temperature on the densities of liquids and solids is small. The compressibility for a typical liquid or solid is 10−6 bar−1 (1 bar = 0.1 MPa) and a typical thermal expansivity is 10−5 K−1. This roughly translates into needing around ten thousand times atmospheric pressure to reduce the volume of a substance by one percent. (Although the pressures needed may be around a thousand times smaller for sandy soil and some clays.) A one percent expansion of volume typically requires a temperature increase on the order of thousands of degrees Celsius. where M is the molar mass, P is the pressure, R is the universal gas constant, and T is the absolute temperature. This means that the density of an ideal gas can be doubled by doubling the pressure, or by halving the absolute temperature. where is the density at a reference temperature, is the thermal expansion coefficient of the material at temperatures close to . The density of a solution is the sum of mass (massic) concentrations of the components of that solution. Mass (massic) concentration of each given component ρi in a solution sums to density of the solution. provided that there is no interaction between the components. Knowing the relation between excess volumes and activity coefficients of the components, one can determine the activity coefficients. that is, 273.15 K (0.00 °C) and 100 kPa (0.987 atm). The Earth 5,515 Mean density. Earth’s inner core 13,000 Approx., as listed in Earth. The core of the Sun 33,000–160,000 Approx. Event horizon radius is 13.5 million km. White dwarf star 7009210000000000000♠2.1×109 Approx. Event horizon radius is 12 km. ^ Values below 0 °C refer to supercooled water. Densities using the following metric units all have exactly the same numerical value, one thousandth of the value in (kg/m3). Liquid water has a density of about 1 kg/dm3, making any of these SI units numerically convenient to use as most solids and liquids have densities between 0.1 and 20 kg/dm3. Imperial units differing from the above (as the Imperial gallon and bushel differ from the US units) in practice are rarely used, though found in older documents. The Imperial gallon was based on the concept that an Imperial fluid ounce of water would have a mass of one Avoirdupois ounce, and indeed 1 g/cm3 ≈ 1.00224129 ounces per Imperial fluid ounce = 10.0224129 pounds per Imperial gallon. The density of precious metals could conceivably be based on Troy ounces and pounds, a possible cause of confusion. ^ The National Aeronautic and Atmospheric Administration’s Glenn Research Center. “Gas Density Glenn research Center”. grc.nasa.gov. Archived from the original on April 14, 2013. ^ “Density definition in Oil Gas Glossary”. Oilgasglossary.com. Archived from the original on August 5, 2010. Retrieved September 14, 2010. ^ Archimedes, A Gold Thief and Buoyancy Archived August 27, 2007, at the Wayback Machine – by Larry “Harris” Taylor, Ph.D.
^ Vitruvius on Architecture, Book IX[permanent dead link], paragraphs 9–12, translated into English and in the original Latin. ^ “EXHIBIT: The First Eureka Moment”. Science. 305 (5688): 1219e. 2004. doi:10.1126/science.305.5688.1219e. ^ Fact or Fiction? : Archimedes Coined the Term “Eureka!” in the Bath, Scientific American, December 2006. ^ “OECD Test Guideline 109 on measurement of density”. ^ New carbon nanotube struructure aerographite is lightest material champ Archived October 17, 2013, at the Wayback Machine. Phys.org (July 13, 2012). Retrieved on July 14, 2012. ^ Aerographit: Leichtestes Material der Welt entwickelt – SPIEGEL ONLINE Archived October 17, 2013, at the Wayback Machine. Spiegel.de (July 11, 2012). Retrieved on July 14, 2012. ^ a b “Re: which is more bouyant [sic] styrofoam or cork”. Madsci.org. Archived from the original on February 14, 2011. Retrieved September 14, 2010. ^ “Wood Densities”. www.engineeringtoolbox.com. Archived from the original on October 20, 2012. Retrieved October 15, 2012. ^ “Density of Wood”. www.simetric.co.uk. Archived from the original on October 26, 2012. Retrieved October 15, 2012. ^ glycerol composition at Archived February 28, 2013, at the Wayback Machine. Physics.nist.gov. Retrieved on July 14, 2012. ^ a b Hugh D. Young; Roger A. Freedman. University Physics with Modern Physics Archived April 30, 2016, at the Wayback Machine. Addison-Wesley; 2012. ISBN 978-0-321-69686-1. p. 374. ^ Extreme Stars: White Dwarfs & Neutron Stars Archived September 25, 2007, at the Wayback Machine, Jennifer Johnson, lecture notes, Astronomy 162, Ohio State University. Accessed: May 3, 2007. ^ Nuclear Size and Density Archived July 6, 2009, at the Wayback Machine, HyperPhysics, Georgia State University. Accessed: June 26, 2009. “Density” . Encyclopædia Britannica. 8 (11th ed.). 1911. “Density” . The New Student’s Reference Work . 1914. Water density calculator Water density for a given salinity and temperature. Liquid density calculator Select a liquid from the list and calculate density as a function of temperature. 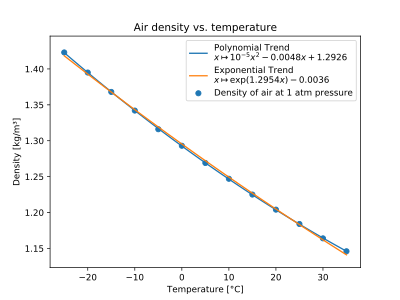 Gas density calculator Calculate density of a gas for as a function of temperature and pressure. Determination of Density of Solid, instructions for performing classroom experiment.